Walking down from Loughrigg towards Grasmere one can see Steel Fell lying on the horizon in the centre of the frame with the summit of Ullscarf to its left. The gap of Dunmail is to the right of it, with Lonscale Fell showing in the background, and the slopes of Seat Sandal on the extreme right. 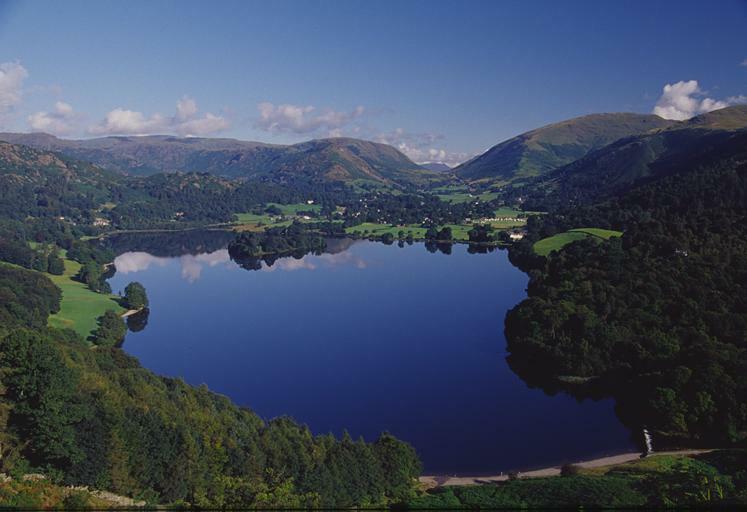 Beyond Grasmere village, and in front of Steel Fell is Helm Crag, perhaps better know by its nicknames, The Lion and the Lamb, or The Howitzer. In the right foreground we can see the Grasmere shoreline and the weir that controls the water level in Grasmere. This feeds to the river Rothay and on to Rydal Water. Smaller version of this picture.